Designed by Helen Nelson in 1918, an easy table runner is constructed from a ﬁlet crochet insertion, fabric, and a wide edging for the ends of the table runner. The insertion, made in strips, would make a lovely bedspread, using the edging for a border. 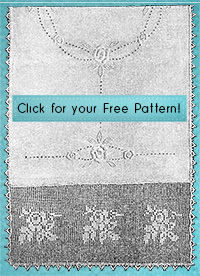 This is not your usual scanned vintage crochet pattern. To make this pattern great for today’s crocheter I wrote complete instructions, expanded the written instructions so you won’t need to skip around, and made an easy to follow chart. I also changed the written instructions to use modern US crochet terms. The only stitches you need to know to complete this lace are: chain stitch, single crochet, double crochet, and slip stitch.